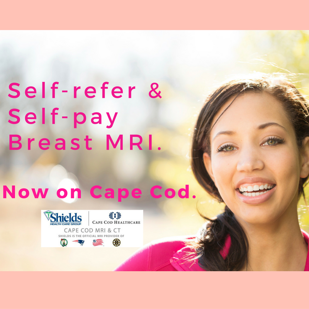 The wave of the future in breast cancer screening is now available only on Cape Cod. A “FAST” scan breast MRI, which is a shorter version of the diagnostic breast MRI, is a new tool in the screening process for women who wish to have an additional level of testing between their annual mammograms. And it can be instrumental in revealing particularly aggressive cancers or providing additional screening for women who are diagnosed as having dense breast tissue. This scan is available to all women, but will likely be most attractive to those who are notified that they have dense breasts following a mammogram. Dense breast tissue can make it more difficult to identify a breast cancer using traditional mammography and it can be missed. Women with dense breasts looking for greater piece of mind can now turn to FAST breast as an option. Women who are considering a FAST breast MRI can contact the Cuda Women’s Health Center for more information or complete this online form and a one of our clinicians will review it and contact you about the study. “We are really excited about offering this to women on Cape Cod,” said Salvatore G. Viscomi, MD, chairman of the radiology department at Cape Cod Healthcare. “We’re essentially taking a diagnostic breast MRI, shortening it, and making it affordable and accessible for all women, not just women at high risk,” he said. The procedure, called First Post-Contrast Subtracted Images – or FAST – MRIs, has been shown to be comparable in quality to longer MRI screening tests. Unlike mammography, which uses low-dose X-ray to show anatomical images inside the breast, MRI shows vascular function within the breast, which can show blood flow to and from a tumor. The screening can detect smaller and more invasive cancers. The FAST screening tool at Cuda will be offered to women who have no symptoms but may have dense breasts. It is especially for women who want that extra layer of testing for reassurance between their annual mammograms. The screening is open to all women on Cape Cod, including those who receive their breast care at Falmouth Hospital’s Seifer Women’s Health and Imaging Center. “The gold standard for screening is still the mammogram,” said Anne Morris, MD, a diagnostic radiologist at Cuda Women’s Health Center. But, together, mammogram and FAST MRI can offer a more complete picture. A diagnostic breast MRI usually takes about 40 minutes compared to FAST breast MRI, which takes about three minutes to complete. The test, although not currently covered by health insurance, is available as a self-pay opportunity, said Dr. Viscomi. The fee is $450. The FAST MRI at Cuda is the first of its kind in the area, as it is not offered in Boston testing centers and is generally limited in the United States. It has been successful in Europe, especially Germany, Dr. Viscomi said. A study done by Christiane K. Kuhl et al at the University of Bonn and published in the Journal of Clinical Oncology, concluded that using specific sequences of the diagnostic breast MRI and reducing testing time to three minutes as opposed to the average 17 minutes, as well as a shorter read time by a radiologist, was sufficient to confirm the absence of cancer. The 443 women in the study had normal or benign digital mammograms. Eleven breast cancers were diagnosed among the women in the study with the long and shortened MRIs yielding the same results. The study also accurately predicted the absence of breast cancer by 99.8% indicating that women with a negative screening truly didn’t have breast cancer. Statistics as well as readings of diagnostic breast studies by the Cape Cod Healthcare radiologists show there is a high risk of breast cancer on the Cape. Health insurance does not cover diagnostic breast MRI for women who are at a high risk due to dense breast tissue. The Breast Density Inform Law, that became effective in Massachusetts in 2015, requires providers to inform women found to have dense breast tissue. Health insurance does not cover supplemental screening. Breast MRI looks at tumors that are vascular and can grow quickly during the time between annual mammograms. If an abnormality is found on the FAST breast MRI, the patient will proceed to a diagnostic MRI, which is generally covered by health insurance. It is a good tool for detecting small tumors not seen on mammogram. It can pick up cancers that breast ultrasound misses.